So a few weeks ago during a phone call with my dad he told me that he planned to install a whole house solar system which I thought was very cool. 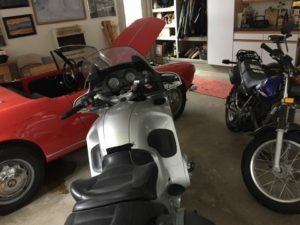 However what surprised me was how he intended to mostly pay for it by selling his two investment lots in Arizona, his BMW motorcycle AND his Alfa Romeo. I am embarrassed to say I don’t recall which year his Alfa is but I think it’s 1963 or 64. So the first three things he was selling made sense. The land, which much like my investment land in Lehigh Acres is worth a fraction of what he paid for it and will likely never recover appreciably. With dad’s aching lower body long motorcycle rides just are not enjoyable any more so there isn’t much reason to keep the bike. Selling the Alfa however is a BIG deal. That car has been around prior to the point in time my memories started. It lived in the garage in the Gouglersville house during most of my childhood. Hell there was a junked Alfa in the barn that was used for some parts as well. The junked Alfa also was my make believe vehicle. I remember crawling into the cruddy, rodent infested cockpit and imagining I was out on the road many, many times. 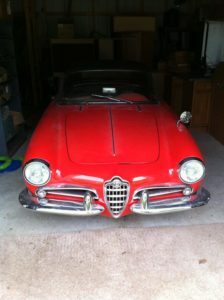 For almost my entire life the Alfa was under some sort of cosmetic or mechanical restoration. At no time was the vehicle driven on a regular basis. I don’t think I would be inaccurate in my guess that during my lifetime the car has seen less than 1000 miles added to the odometer. When I got my drivers license it happened to coincide with a time where the Alfa was actually running. I got to drive it a few times and even took it to my senior prom. The car had a very unique, low posture and the ticking sound it made before you started it will always be ingrained in my brain. The car has moved around the country with dad, from PA, out to New Mexico, and back to western PA in the span of about five years. When I say the car was undergoing restoration for the last 30 years or so I am not exaggerating. Some of the work dad did himself but a lot of it was outsourced which of course lead to a LOT of money being spent over time. I would say the restoration more or less was complete a couple years ago although I think there were still a few things left to do. So anyway, yea, for dad to be willing to finally let go of his young man hobby car after more than four decades is a real big deal. I talked to him again today and it sounds like he actually has a legitimate buyer lined up for the car, via Craigslist no less. If things go well, as of this weekend the Alfa Romeo will no longer be under roof. I am curious if dad will feel similar to how I did with the SSR, where I surprisingly felt minimal remorse after it was gone. The sale of the SSR allowed me to do a lot of great things. The sale of the Alfa is going to allow dad to become much more energy independent which is something that sounds very appealing to him at this point in his life. I’m proud of him for making the decision to let the car finally go, it was a long, very long, time in the making. Hell the car almost felt like a distant sibling that was always around but never said much. The older I get the more I put value on things I do, feel or accomplish and less on what I own. You can’t buy happiness, after all.